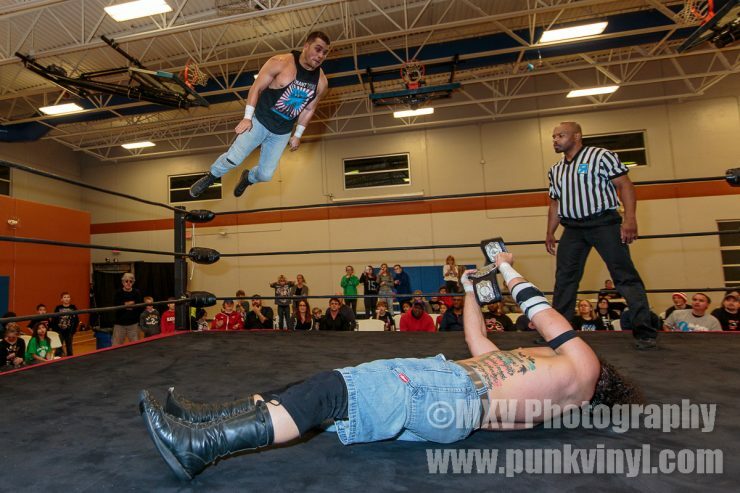 Resistance Pro ended their 2016 on Saturday with their fifth anniversary show which was also the fourth annual Sam Thompson memorial show. 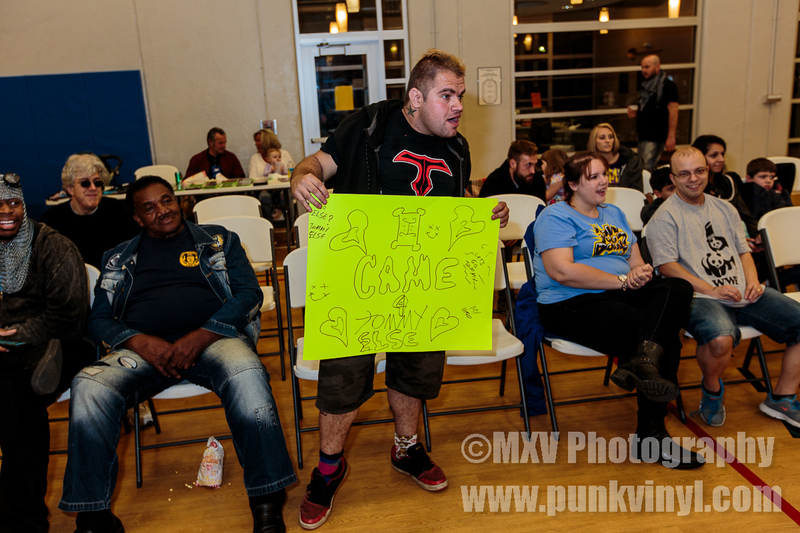 One of the main attractions of the show was a tournament to crown a new women’s champion after Crazy Mary Dobson retired from RPro and vacated the title (because she just got signed by WWE!). The heavyweight and tag titles were also on the line in some very high-profile matches. The first match was also the first match of the women’s tournament. 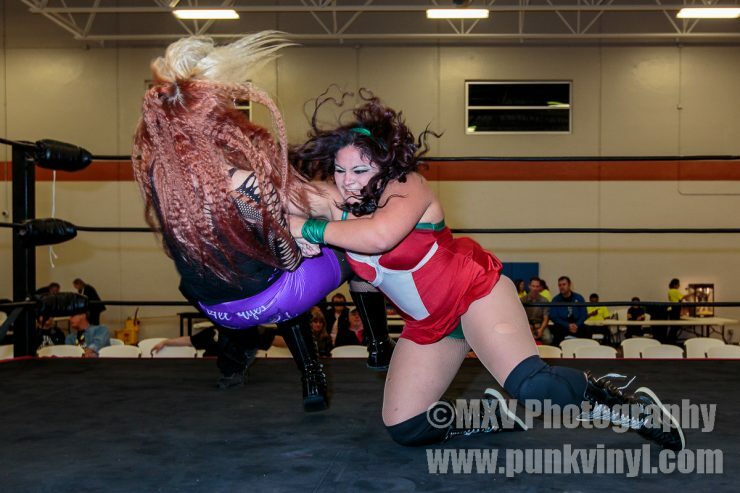 Amazing Maria faced Paloma Starr. Paloma came with all guns blazing right from the moment the bell rang and was looking strong but some pokes to the eyes and a handful of trunks during a roll up saw Maria steal the win. Paloma was furious and rightfully so! Maria advanced in the tourney and Paloma was eliminated. 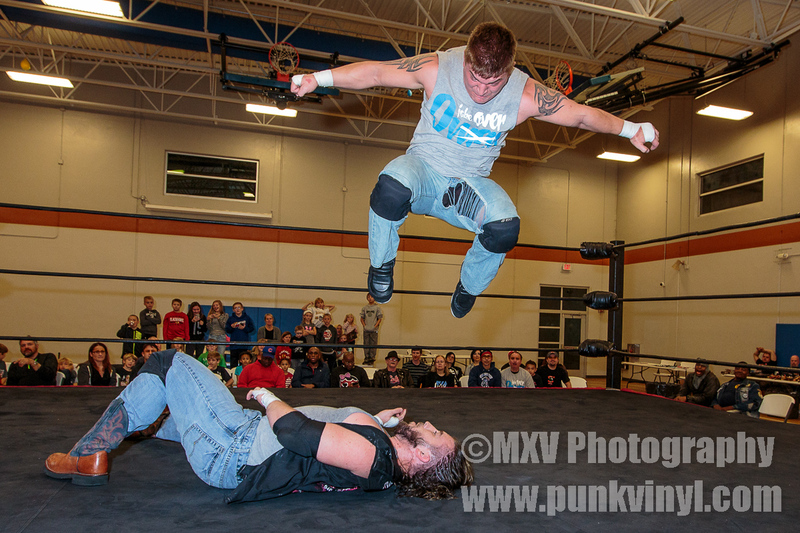 In a no-DQ match, Tommy Else finally had a chance to settle the score with Cody Jones. Tommy started strong until Cody tried to take advantage of the match stipulation by punting Tommy in the balls. The moment he did, Cody appeared to have hurt his foot and that’s when Tommy reached into his trunks and pulled out his nut cup! He stuffed it in Cody’s face and then gave him some additional beating. Cody turned the tables for a while but Tommy rallied and got the win. BD Smooth was in the front row cheering Tommy on and came running into the ring after the match to congratulate him. Tommy looked puzzled by the entire thing and left the ring. Smooth got hit with a brain buster by Jones for his troubles. I guess that’s the price you pay for being “Tommy’s biggest fan”. When he came to, BD Smooth grabbed Tommy’s nut cup and cherished it like it was a treasure and ran away, probably to put it in his Tommy Else shrine. 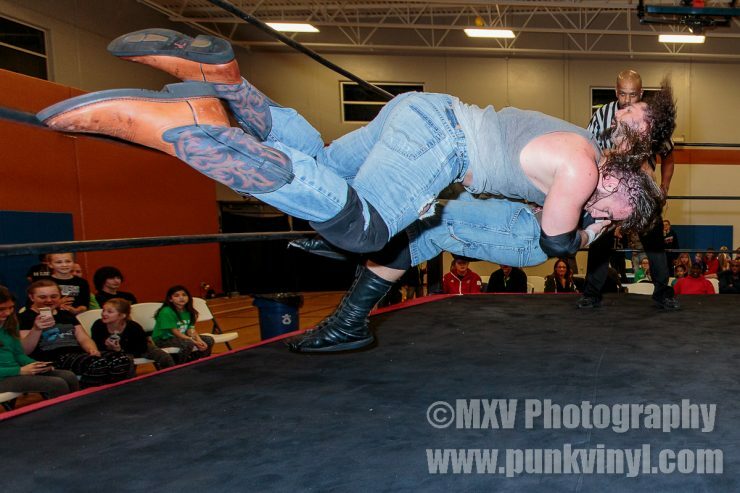 In the second match of the tournament, Rachael Ellering (daughter of Road Warriors’ manager, Precious Paul Ellering) faced Miss Hannah. 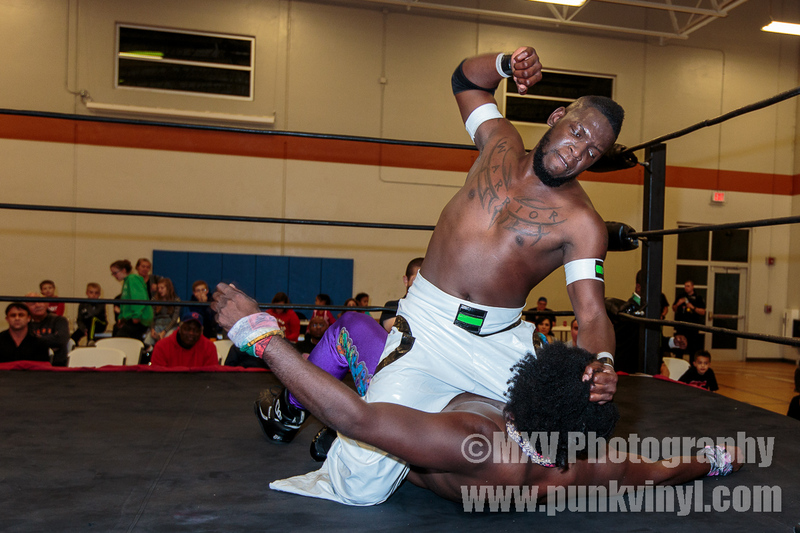 These two had a hell of a good wrestling match with a lot of good mat action as well as some brawling. After about ten minutes, Rachael got the pin to advance to the finals where she’d be facing Amazing Maria. Next up we had The Irish Car Bomb Sean Mulligan vs. Daniel Eads. These two guys were looking to have one hell of a good match when Mulligan landed funny and separated his shoulder. The referee counted him out and ended the match only a couple of minutes in. Hopefully Sean will be OK and return soon. 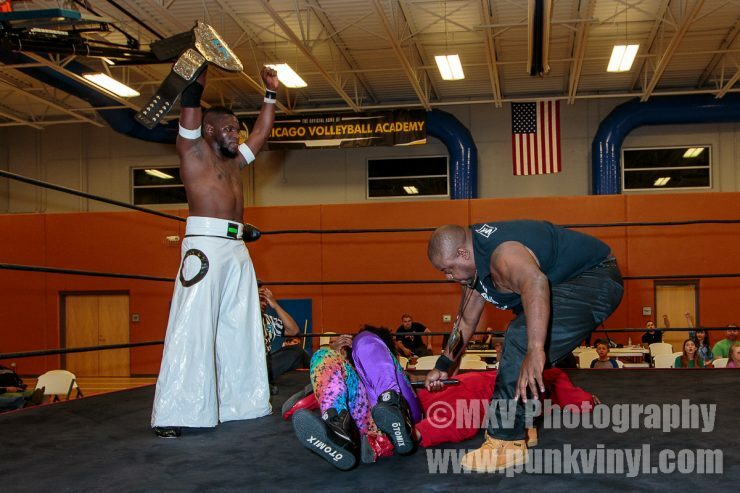 Mad Man Pondo, D’Angelo Steele, and Willie Richardson faced each other in a triple threat match. 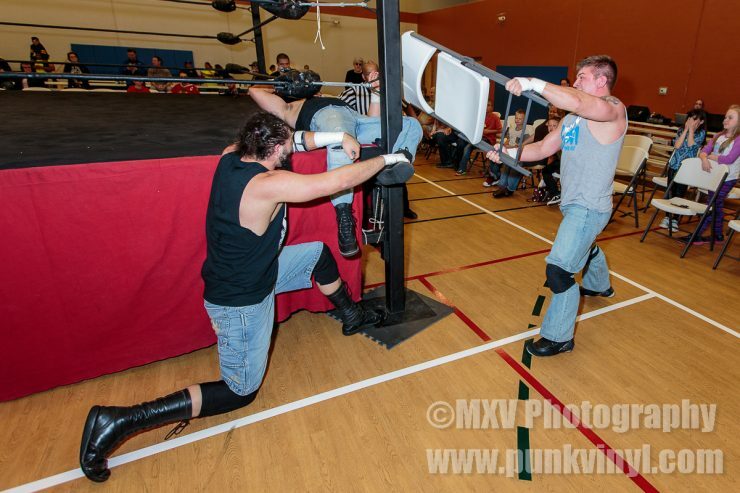 This match was contested under regular rules which must have confused Pondo because a few minutes into the match he grabbed his stop sign and waffled D’Angelo with it while Willie was outside the ring. The ref called for the bell, disqualified Pondo, and awarded the match to D’Angelo. 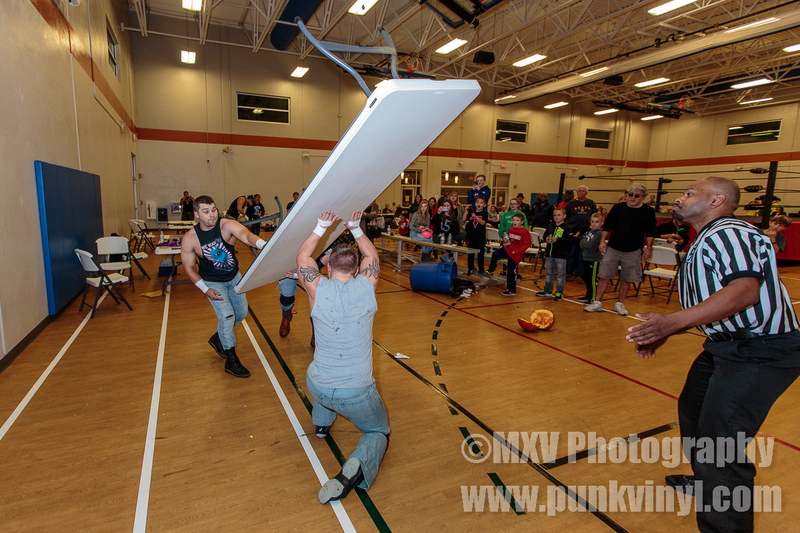 Main Street Youth had one last chance to regain the tag team titles from The Bruiserweights (John Skyler and Corey Hollis) and this time they did it in a Texas Tornado Street Fight! Falls counted anywhere, all four men fought at once and there were no other rules. 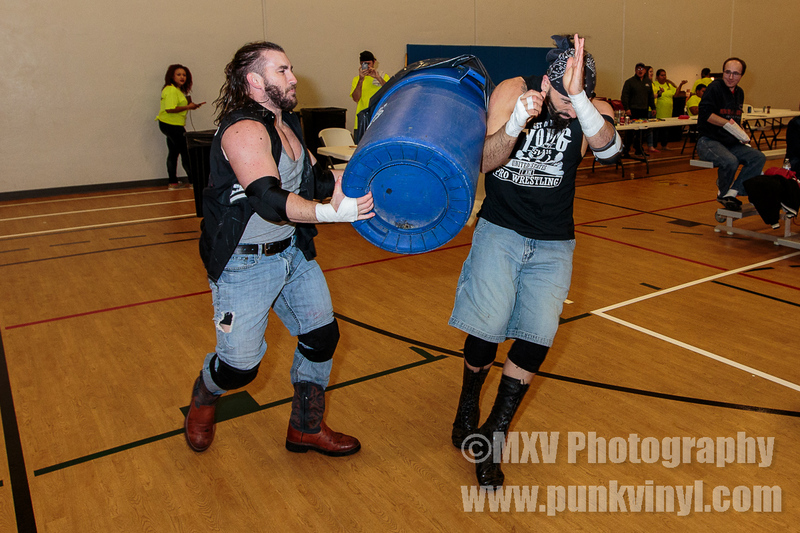 These guys battled around the entire building and beat each other senseless with everything they could get their hands on. During the match, Main Street Youth did a number on Corey’s knee with a chair and the ring post and he was helped to the back, leaving his partner to take on both men alone. Skyler held is own the best he could but was starting to lose the battle when Corey came limping out to help his partner. 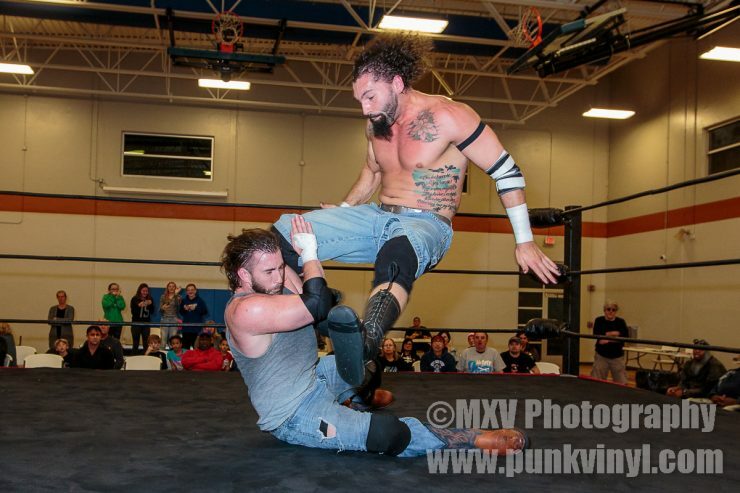 They put up one hell of a fight but when Hollis was locked in a submission hold that was targeting his knee at the same time Scotty Young was choking him out on the bottom rope, he passed out and the referee called for the bell. 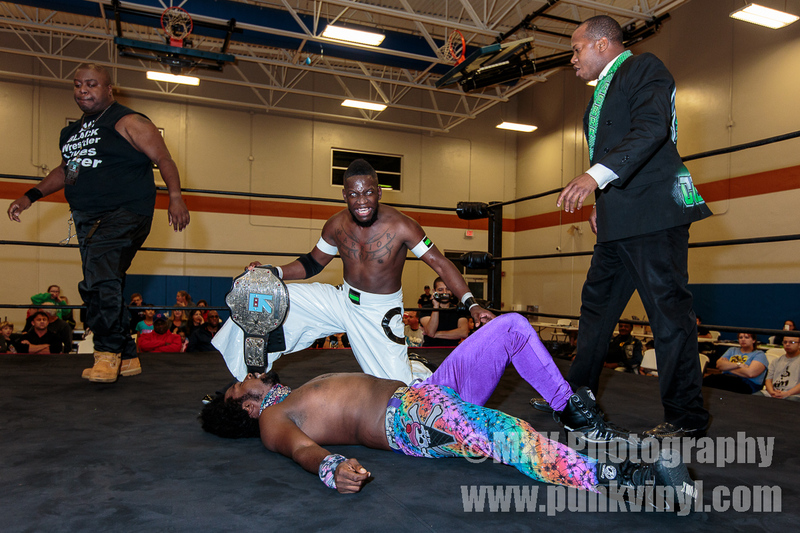 Main Street Youth recaptured the tag titles in what was an amazing tag team brawl. After one year of climbing his way back to the top, Suge D finally had his rematch for the heavyweight title against Cobra. Suge came out dressed like Prince and was having fun with the crowd but once that bell rang he was all business. Suge targeted Cobra’s upper body and kept trying to lock on his snake charmer hold on them but Cobra kept slithering out. These guys were having a great battle and Suge was continually getting the upper hand. 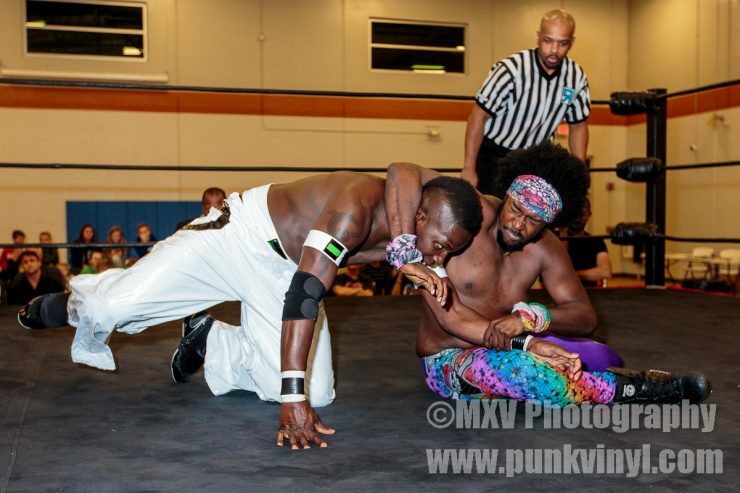 Suge finally got the snake charmer locked on and right as Cobra was starting to tap, Justin King hopped up on the apron to distract the referee. 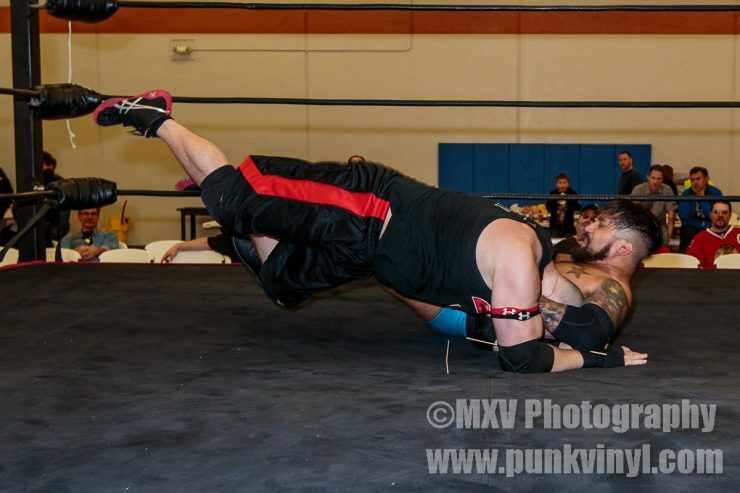 Suge broke the hold and went after him on the apron. 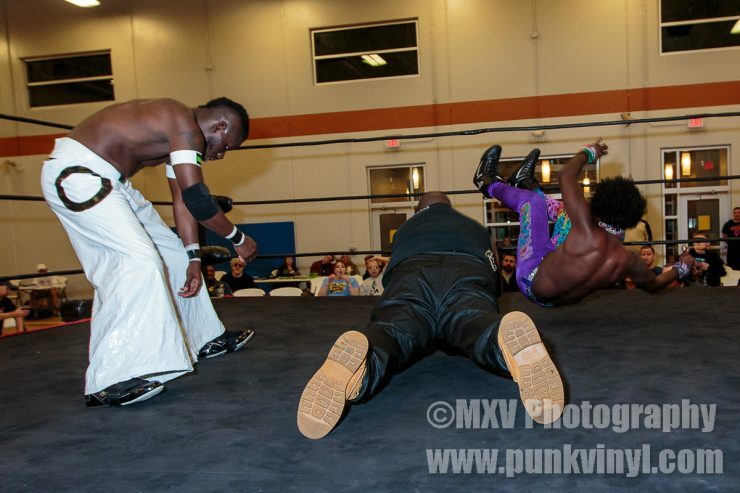 He turned around right as Cobra was trying to hit him with a spin kick and ducked it, which unfortunately resulted in Cobra kicking the referee and knocking him out. 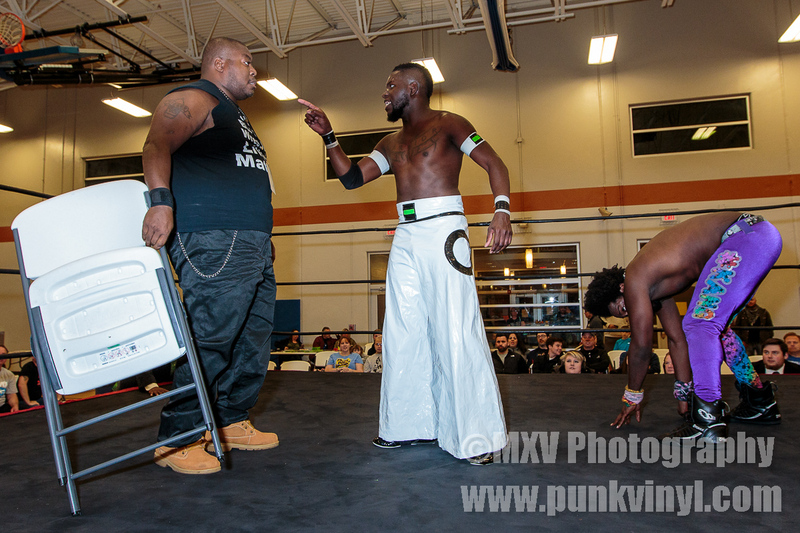 Justin King brought a chair to the ring and gave it to Cobra who intended on using it on Suge. Willie Richardson came to the ring and pulled the chair out of his hands. 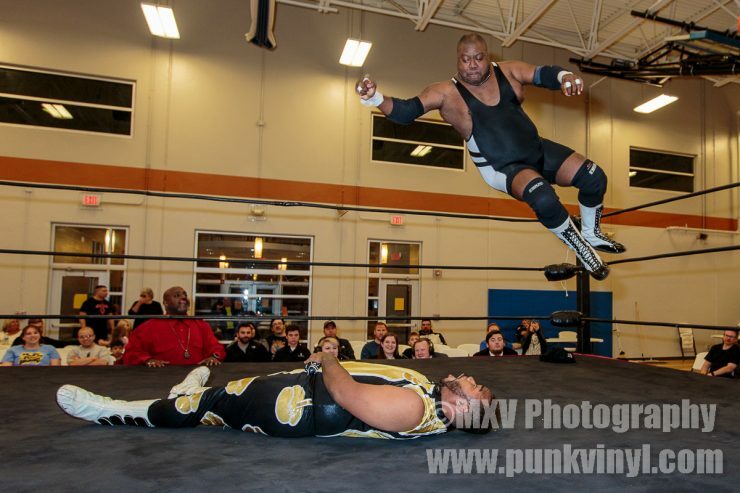 Suge hit the ropes and was going for his flying knee on Cobra when Willie suddenly turned and pounced him! He turned on Suge and joined up with King Cobra. The two beat on Suge some more and then Willie left the ring. 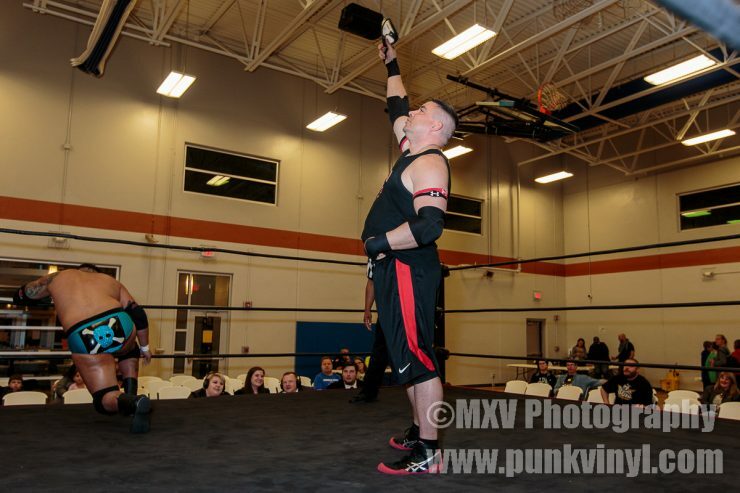 King revived the referee just in time to have him count the pin on Suge and award Cobra the match. 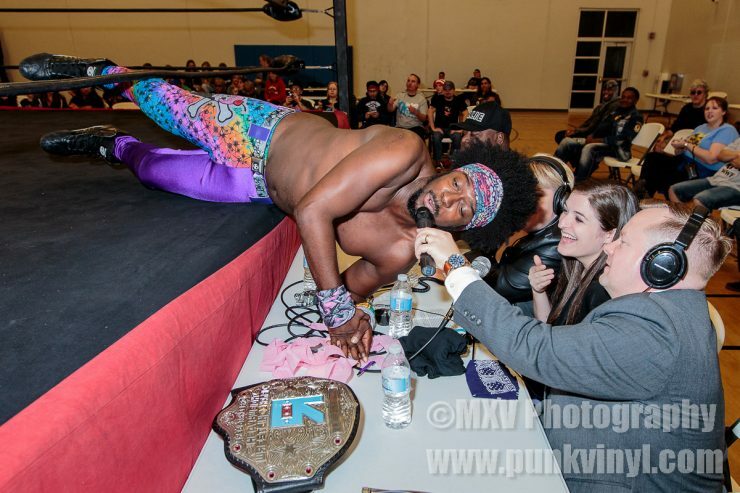 After the match, C-Red came to the ring to confront Willie. Willie then pulled out a blackjack and beat the crap out of him too!Suge covered him up to protect him and took the beating instead to keep C-Red from taking any more punishment. 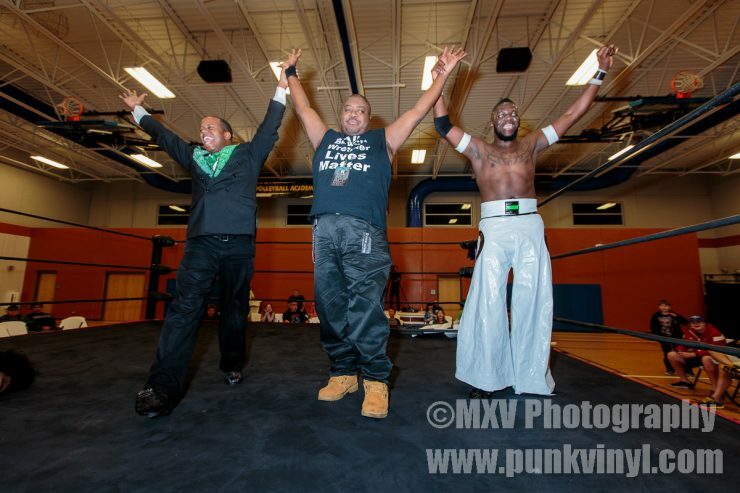 Cobra, King, and Willie left the ring gloating about their dastardly handy work and the crowd was stunned. In the final match of the night and the tournament, Amazing Maria and Rachael Ellering locked up to decide a new women’s champion. Paloma Starr was the special guest referee. This was another solid match which showcased some of the finest female talent. Maria once again fought dirty but Rachael was more than ready for it and overcame it all to become the new Resistance Pro women’s champion, a title with an amazing legacy. Road to Ruin was a very good show, a good tribute, and a great way to end a year of wrestling for the company. Next year should be a huge one for the company as well!